One of the main points covered in depth at Huawei Connect 2018, held this past week in Shanghai, China, was the breadth of positive changes that a broader deployment of artificial intelligence can bring. Additionally, Huawei detailed its strategic approach to the emerging technology. Those changes, incidentally, will likely cut across, reshape and affect all industries and businesses. For example, intelligent transportation will make traffic more efficient while autonomous driving and electric cars will change how people get around, as well as change the automotive industry. Beyond that, we will likely see personalised education that makes learning and teaching more efficient for students and teachers respectively, while healthcare will be transformed by early prevention and precision treatments, to eradicate cancers before they progress and extend longevity. Huawei chairman, Eric Xu noted that it in order to fully unleash the value of a AI, it is critical to define how it is positioned. He explained that Huawei recognises AI as a combination of technologies that, together, form a new general purpose technology (GPT). It’s certainly not the first GPT the world has embraced; previous technologies of this nature also had a dramatic and far reaching impact on the world. Some examples of GPTs that came before were the wheel, iron, railways and electricity, and subsequently, automobiles, computers and most recently, the internet. He continued that economists have observed that, throughout human history, there have been 26 technologies that can be classified as true GPTs, with AI taking its place among them. “By emphasizing AI’s role as a general purpose technology, my goal is to call your attention to how influential and valuable AI is to our future. As a GPT, AI will help us find more efficient solutions to problems we already know how to fix. It will also help us address problems that, to date, have remained unsolved,” he added. To this end, Huawei’s AI strategy consists of five keypoints. They include investing in AI research; building a full stack AI portfolio; developing an open ecosystem and talent; strengthening their existing portfolio, and finally driving operational efficiency. More specifically, the company’s research is aimed at developing fundamental capabilities for machine learning in arenas of computer vision, natural language processing, and decision/inference. Xu stressed that machine learning needs to be secure and trusted, efficient from a data and power perspective, and autonomous. 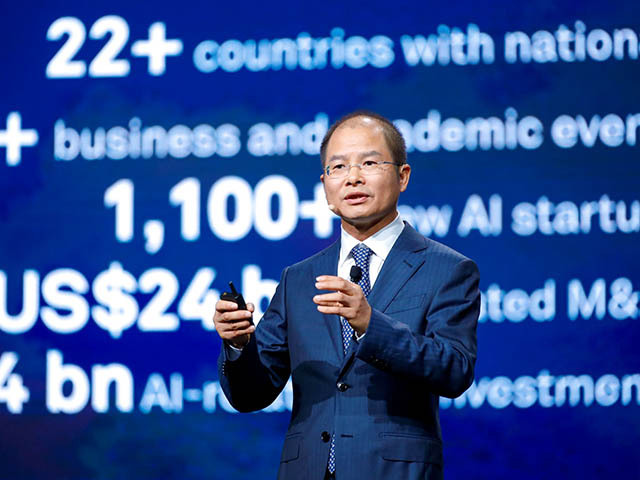 Elaborating on the AI portfolio piece of the strategy, he then announced Huawei’s latest Ascend AI chips, the A910 and the A310, which the company billed as “the world’s first AI and chip series.” Together, they are destined to find their place in a broad array of scenarios, from the public clouds and private clouds relied upon by enterprises, through to consumer devices such as the smartphones we carry in our pockets. Watch out, for example, for the upcoming Mate 10 to join the ranks of previous HUawei smartphones that will include AI for better performance. In between the two, the chips are also intended to enable intelligence in edge computing in all its forms and industrial IoT devices. Moving on, Xu elaborated that developing an open ecosystem and talent entails collaborating widely with global academia, industries and partners. As well, under this point, the company announced its AI development programme. This includes investing over $140 million in AI talent education while cooperating with universities and scientific research institutes to develop AI courses, publish textbooks, and support scientific research and talent training. Additionally, the company revealed that it will be helping universities and research institutes build AI labs, and participate in AI related programmes held by the Ministry of Education. As far as the fourth and fifth key points of its strategy are concerned, Xu explained that the company will strengthen its existing portfolio by “introduce an AI mindset and techniques” into existing products and solutions to create greater value and enhance competitive strengths. Finally the company plans to drive operational efficiency at Huawei by applying AI to massive volumes of routine business activities for better efficiency and quality. Clearly, Huawei is going all in on Artificial Intelligence, with it betting that the technology is more than a science fiction aspirational fantasy, but rather an evolution of the computer whose time has come.